Create CD mixes by dubbing irreplaceable LPs and tapes, or copy full CDs. 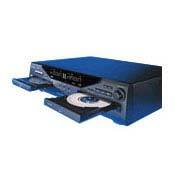 TDK's Digital Audio CD Recorder is the ultimate digital recording tool. A dual-tray design generates easy-to-read digital dubs from CDs, and with 4X dubbing speed, you get the swiftest dubbing the industry offers. The Digital Audio CD Recorder sets you up with complete digital and analog recording flexibility- including a full complement of the digital and analog inputs to accommodate any music source, plus analog and digital outputs. Superb A/D converters and CD recording assembly. Low jitter. Decent D/A converters, headphone jack, and meters. D/A converters don't sound as good as the Cirrus Logics in my AVR7200 or the Burr Browns in the Pioneer DV655A-PX or Denon DCM-370 (hp mod). Also would be nice if it had a DAC Mode without needing a CD in the record side in pause. AD converters (and surrounding caps/circuitry) are better than the AKM's in my Emu 1212m. DA converters are better than those in my Numark PPD01 24/48 dj mixer. You can use this unit as a standalone DAC; just put an audio CDR in the record side and pause it. It will stay that way indefinitely without problems. 24/96 converters are outstanding on both ends of this thing, though I would say the output ones are not as good as the input ones. The ADC's create incredibly tansparent, liquid Red Book copies and the resulting disks have been error-free every single time, apparantly with low jitter. I use TDC audio CDRs. It's a shame I can't record in 24/96...or can I? Hmm...wonder if the SPIDIF would output the stereo signal to the Emu and what format would that be? Worth a try, I guess. High sound quality as standard CD player. Audiophile level results when used to make copies from analog sources. Easy to use. Manual with some gross errors. The letters of the remote control are difficult to read because of their small size and low contrast against the background. I have used the TDK DA3826 recorder almost exclusively to make copies of my LPs, with outstanding results. It is difficult to distinguish the CD copy from the original vynil sound, which means that the AD conversion is of audiophile level. I have got much better results with this recorder than with more expensive recorders from other brands. Cd recorders from Marantz and Phillips. Manual an obvious translation from Esperento. But if ya kin reed, ya kin figer itout. Head phones? Who needs stinkin head phones? There is a phone jack on the front of the unit. Don''t knowe what it does. Also I have a phone jack on my preamp, which I could listen to recording through if I wanted to. Instead I just listen through the tape monitor function. I can hear everything just fine. Also there are the visual meters for external input adjustment. Totally NOT and issue. What everybody else said plus: Easy to use, both dubbing and analog recording. Some generational quality loss in copies, but very acceptable. Great value $$ wise. Output quality as a straight up CD player is very good, bettr than the Sony, Rotel and Pioneer stuff I have. Would I buy it again? Absolutely. Great A to D converter, good sound, quiet background, speed. I needed a CD recorder to transfer live music recordings off DAT, reel to reel, and cassette. After doing some listening tests at several local dealers on Marantz and HK recorders, I came across the DA-3826 on the TDK website. Since I was unimpressed with what I had heard so far (harsh glaring sounds from copies of CDs when compared to the originals), I decided to investigate the DA-3826 further. Reviews in proaudio sites and this board convinced me that the TDK recorder may be what I was looking for. No Boston dealers had a unit to show (or sell to) me, so I ordered it on line... sight unseen. My unit is made in Korea, so I do not know the quality of the build...I shall report on it if I run into trouble later. The sound quality from analog sources is fantastic, which says that this unit has a great A-D converter. Digital copies can sound harsh at times, but overall not very objectionable. The unit automatically goes to a new track when you pause the recording, which can be annoying if you want to number several sections (e.g. movements) as a single track. While the previous reviewer''s comments on not having a headphone circuit that will allow the monitoring of the recording process is valid, I can hear it on the analog output from the CD-R side....not a show stopper for me. Overall I am happy I made this purchase. Easy to use. excellent quality recording. looks real good. Gold plated terminals. Speed of Recording. Accepts optical, coaxial and analog connections(though for CD to Cd recording you'll never need them). What can I say ? I love this CD burner ! The Speed, the quality, the look, the price. This is probably the best audio purchase I've ever made. I bought it after I received a refund on a defective Philips CDR 570 - that gave me no end of hell. I can find absolutely nothing to complain about with this Burner - TDK really must of put effort into making this thing. I've burnt almost 50 CDs with this baby already and have never experienced a problem with it. So what more can I say ? If you're looking for a dual deck CD Recorder TDK is definetly the way to go. Philips CDR 570 CD Recorder. Really incredible deck for the $$$. Easy to use controls. Good looking. Excellent sound. Excellent price point for a beautiful addition to my system. So easy to use, excellent manual leads the way to simple disc-to-disc recording as well as vinyl to disc. Auto track markers area bit tricky when recording from a turntable, but you'll get the hang of it. The CD's produced really do sound wonderful. Audiophile-grade Digital-to-analogue converters work great - very warm and smooth sound. I can't see paying JVC or Marantz twice as much for their decks....and Phillips should be ashamed for the crap they've introduced - sheesh, I mean come one theyt invented Compact Discs for chrissakes! Anyway, this CD recorder is great! Buy it, you'll like it - don't let the low price scare you away - it far outclasses and outperforms the Teac's, Denon's, and Sony's in its class. Can make high quality recordings with analogue input through mixer, or external CD player and internal cd copy. Fast speed, simple operation, seems well constructed. Unable to monitor recording of externally supplied signals by headphone! This may surprise you as to what you have recorded when you play the recorded disk back (Good surprise or Bad surprise). LED text difficult to read. All text on controls needs to be more legible -- too small and not easily read in less than optimum light. Unable to monitor externally input material through headphone jack during recording! Can only use meters to indicate recording level, and these may not even respond on very soft sounds. I researched this recorder as extensively as I could before buying. I intended to use it for high quality live recordings as well as dubbing CDs and MDs, and archiving to CD a large collection of LPs, reel-to-reel tapes, and cassette tapes. I find it a shame that it is just not practical to use this otherwise fine machine due to the oversight of TDK in failing to provide headphone monitoring ability during recording. Phillips allows easy aural monitoring over headphones which at least gives some idea of what to expect in the final sound. It is wrong of the manufacturer to promote the TDK DA-3826 as acceptable for making CDs of analogue input material and other external recordings when it is impossible to aurally audition levels through its circuitry before and during recording. I would give the deck a qualified very high rating in sound quality, and especially as a good value for the money, but I feel that this singular feature fault disqualifies the deck for recommendation to any serious audiophile (thus the low overall rating). It is like having a great performing automobile with a blacked-out windshield(You could always look back and see where you have been after driving a while)! It is satisfactory only for CD dubbing, as you know that it will make an exact copy. I intend to exchange mine for another brand deck. My qualifications for judgement of this deck include a background of many years in music education and as a recording technician.